The new leader of Sudan’s interim military council has cancelled night curfews that had been announced two days ago. After the overthrow of President Omar Bashir, the military council announced night curfews but thousands of protesters defied the order as they stayed on streets. On Saturday, new leader, Lt-Gen Abdel Fattah Abdelrahman Burhan announced the night curfew had been canceled in a move intended to reduce on pressure from protesters. In a televised address on Saturday, the new leader said he would restore all state institutions in a bid to uproot the regime. 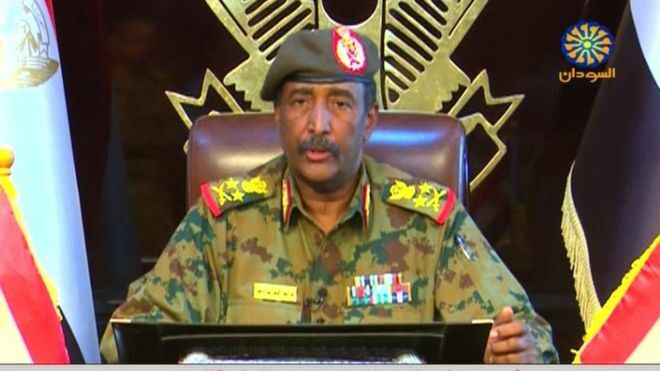 Following the overthrow of Bashir, who had been in power for 30 years, security chief Gen Salah Gosh, Defence Minister Awad Ibn Auf, who were the coup leaders assumed power but later stepped aside as protested continued. The protesters demanded an immediate move to civilian rule despite Bashir’s overthrow. In his Saturday address, Gen Burhan announced the release of jailed protesters and dissolution of all provincial governments. He called upon the opposition to work with him to restore peace in Sudan. Following his oust, the Sudanese military council on Friday announced that it would not extradite Bashir to face allegations of genocide at the international war crimes court but instead he would go on trial in Sudan.